Maybe you need to drive it more often? Sitting helps no vehicle. Also, more miles would lower the cost per mile of ownership. I mention it as there are several posters with good success out of this platform. I mean, all newer cars have lots of potential electrical gremlins. I suppose one may over look some things if the car fits the driver. If you don't like it, you don't like it. Yeah, I don't end AWD at all. I found some mud once in the two years I owned the Outback and that was the only time AWD was useful. The non-turbo thing isn't ideal, but again, this car is replacing an Outback 2.5 liter. It's painfully slow. I almost think no boost will allow me to truly leave this car alone. Plus, my 142 is plenty fast. I've got plans to go look at a couple this week/weekend. Well, that was a bust. I went and looked at a 2004 FWD turbo wagon tonight. It was super clean, sounded good at idle, but the engine/trans was pretty covered in oil. Took it out for a test drive anyway, and as soon as I stepped on it it went into the worst limp mode I've ever seen. It wouldn't rev over 1500, and it showed "REDUCED ENGINE PERFORMANCE" on the dash. Any ideas what that could have been? I'm bummed because I liked the car other than that. After that, I checked out an '05 FWD non turbo. It had less oil on the underside, but it was considerably rougher. Idled pretty rough in gear, and was cosmetically not great. The search continues, but I'm wondering if I'm going to have to bump my budget up a bit. It's hard to say without pulling the codes. There's definitely a better than average chance that it is related to the throttle body. Keep shopping. I am sure there will be better examples, but you did get to drive one. Touch it, feel it to see if fits you. Touch it, feel it to see if fits you. Uh, why not buy a used Honda CR-V? B: At all given they only sold like 200 of them. And it'd be 2 years older than your subaru and with a more fragile drivetrain. Maybe less soul-less, but probably not an "upgrade." in any particularly meaningful way for a boring DD. Drove a 2007 (last year) M66 V70T5 that was dirt cheap at auction. Should have bought it, didn't realize they sold all of like 3 of them . No sunroof or power seats either. But cozy leather seats, quiet and terrifyingly faster than any FWD car should be without a lot of BS to break. Pity they don't sell V70 with the Yamaha V8 instead of all the volvoid garbage/shyte. Japanese, sounds pretty, no timing belts, no stupid crankcase vent bull****, not much plastic crap in place of properly spec'd metal parts etc. Just tight in the engine bay, crank seal leaks and swells the crank pulley rubber causing to spark on some, fix the accessories before it rips the front timing cover (VERY AUDIBLE WARNING with plenty of time though). I do like that the P2 cars don't have SAS & EGR unlike the late P80s though. Tho stupid VVT solenoids and gears that go bad if the PO didn't change the oil en lieu of that/designed to accomplish the same emissions goals, but less busy engine bay with fewer sharp/rusty things to cut your hands on the bright side! I wouldn't touch most P2s with a 39& 1/2-foot pole locally in our market. They're dirt dirt cheap (even some real decently maintained V70Rs with a huge stack of receipts are dirt dirt cheap here), too many of them, super roached down, interior falls apart on the warm weather/UVed out cars, don't hold up well with short trips/running rich with a bunch of condensation filled oil. Apparently GTJordan sees ones that people actually take to the dealer and care about in canada, not cars hacked on by illiterate monkies in the average american market where people keep cars for 6 years and throw them away...they probably maintain their cars, keep them fixed up to avoid getting stranded in a life threating situation 100 miles from a single person with it being -60 out and all of like 3 people that live in canada in a 1000x3000mile country and plan to keep them as long as they reasonably can up there I'd guess. I'd look for an 05-07 with no sunroof, no options from the original owner and babied of the P2 V70s honestly. Buy a cushy 4-runner or FJ cruiser/real car and treat yourself instead of eurotrash bull****? Or electric car if you drive less than 100 miles a day and rent/uber/borrow for the rest (no maintenance). There are much worse cars, but there are much better ones too and most of the P2s around here are borderline used up Cali probably even worse for roached down and UVed out interiors that crumble and engines/transmissions leaking from every imaginable seal ridden hard in 100 degree weather on sludge/baked fluids and put away wet. Last edited by Kjets On a Plane; 01-06-2019 at 08:56 PM..
Only made and sold in Canada in 1997 as a AWD test market car. 214 made....I'm a Volvo repairshop and haven't seen one now in 5 years...less than 30 probably remaining. Never sold in USA. The wobble is loaded full leather AC climate control third row seating. Interior is perfect and everything works. even A/C. I'm not getting a CR-V because I don't like them. I prefer how a car drives, compared to a cross-over, and I want a wagon. V70 seemed like a logical choice, given the criteria, and the fact that I know a bunch of Volvo people. If I can't find a nice V70, I may just find another 2000-2004 Legacy/Outback and be plenty happy with it. I did, however, just find a 2005 V70 2.5t Automatic. 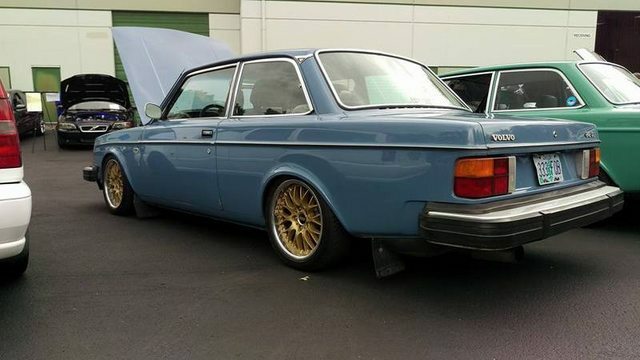 The ad says that all service was done on time at a Volvo dealer, but it does have 215k miles on it. From the pictures, it looks really clean. Should high mileage scare me away from these cars, even with good service history? Well, I'm borderline embarrassed to say it, but I ended up buying a 2003 Subaru Legacy wagon last night. I never thought I'd actually spend money on one of those cars, but it turns out I kind of like them. Thanks for all the advice, one way or another. My only concern would be the head gasket. Exactly. It works. Cheap, simple, practical. Headgaskets, timing belt, water pump were all done 3k miles ago. I'll probably be a minority here...but I would look at an e46 wagon before any P2 cars. I have worked on a ****load of both chassis and the bimmer is way more robust and reliable....and there is no comparison on how much better the E46 interior bits hold up. Other than needing a cooling system very 80-90k and the potential for cheap fix oil leaks from time to time, they are great cars. You might also look into an E39 wagon if you want something larger. I wanted to, and to pick stuff up, but as it is we didn’t even get home until 1:30am. Wife would have been pretty bummed if I added another stop to the agenda. Fun isn’t the word I’d use, per se. my Outback was decent with the 5 speed. But the automatic is kind of a bummer in this new car. But I love not having to shift in traffic. Unfortunately I sold the Outback before using it for parts. The Legacy 2.5GT wagon always sounded fun. I hav an '02 with 270k. Trans is fine. It was regularly serviced and had the software updates done as soon as they were posted. Bought it for cheap with a thick stack of service records and a burned exhaust valve. Bottom end looks great; crosshatch on the cylinders looked perfect. I like the car. It's a lovely couch. P2s tend to have several easily addressed weak spots but once addressed, and as long as the car is regularly maintained, they are great. That too. P2s are kind of stupid to work on.